After a short drive out of the city and into the bush in the back of a dusty truck, I found it hard to believe what I was seeing. Inside a fenced off area a group of people were sitting on a picnic bench chatting away and…wait…what…this can’t be right…several lion cubs and two full grown cheetahs sitting within a few feet of them? Was I seeing things?! But no, my eyes were working perfectly fine it seemed, as we were shown to our room within the fence. 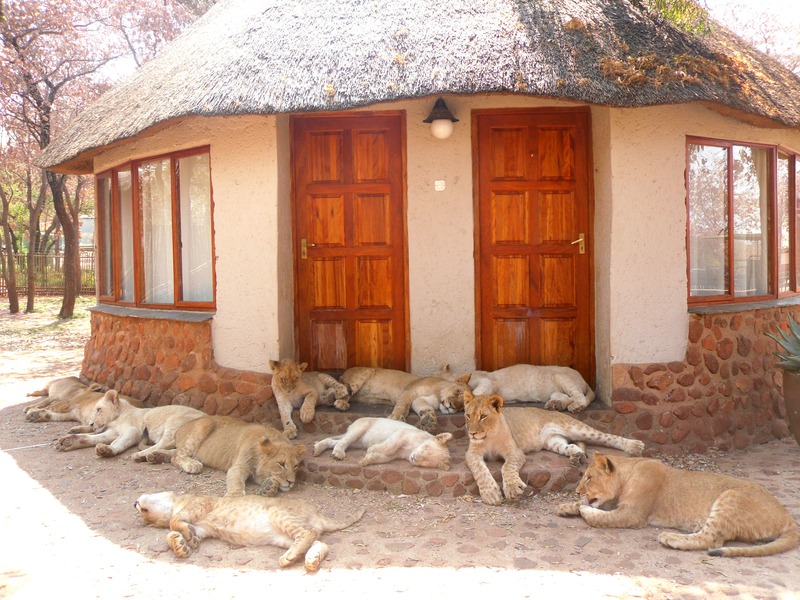 Yep, our little cabin at the lion reserve was actually inside the lion enclosure. 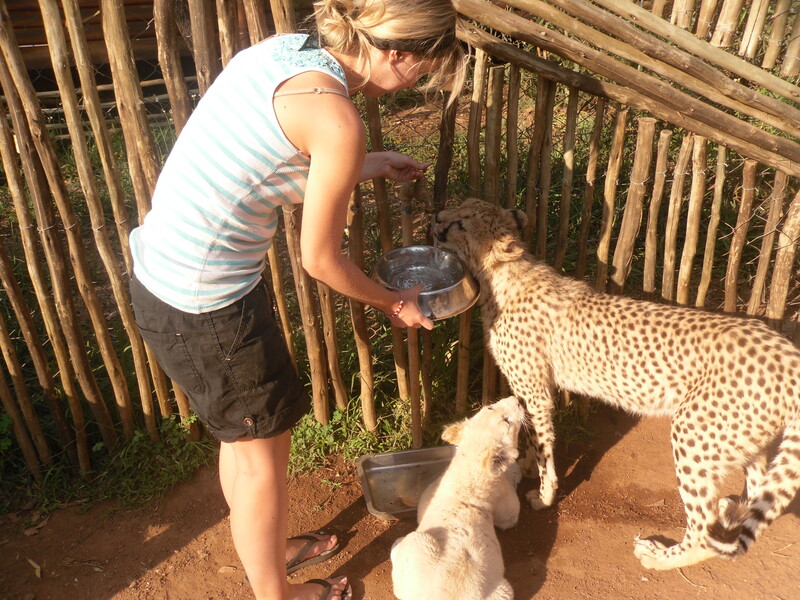 I knew that we would be working closely with lions – that’s what we’d signed up for when we decided to volunteer at a lion sanctuary in South Africa that looks after orphaned cubs – but this went far beyond what I could have imagined. At first I was slightly nervous – who wouldn’t be when you’re this close to such powerful animals? 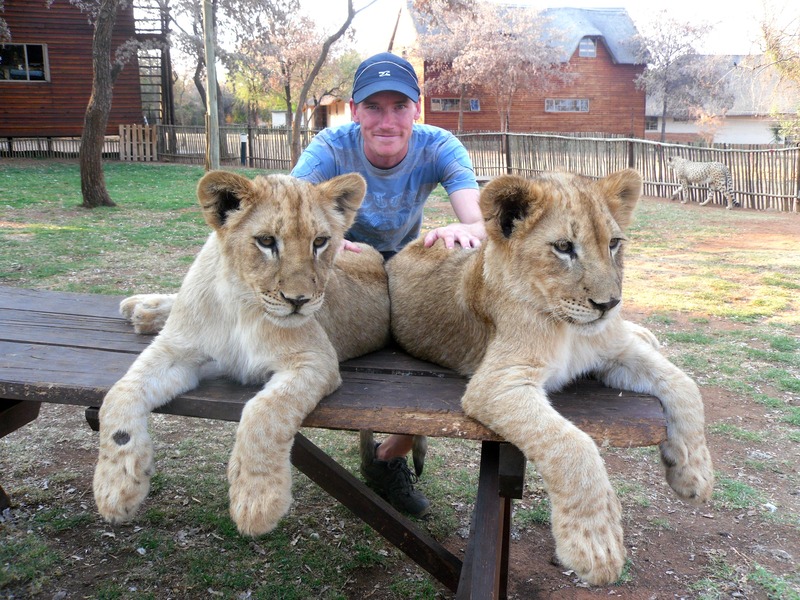 And even though they were cubs, a five month old lion cub is still pretty big. The fully grown adult cheetahs, wandering around the enclosure like they owned it and looking after the cubs as if they were they own babies, made me even more nervous especially the male who was scared of people after seeing his mother being killed by poachers. But you soon realise that they’re just like your normal domestic pet cat – just a slight bit bigger and with sharper teeth! Cheetahs even purr like cats! The cubs like to play with you, chase balls and dangly things, chew on any flip flop, book or bottle that’s left around for them to find, jump on your back when you crouch down, and nap an awful lot. If they’re being too rough or start playing with their claws out, they understand when you tell them no and retract their claws to play more gently. And with the bigger lions, simply pointing a stick at them and telling them no will make them back off. 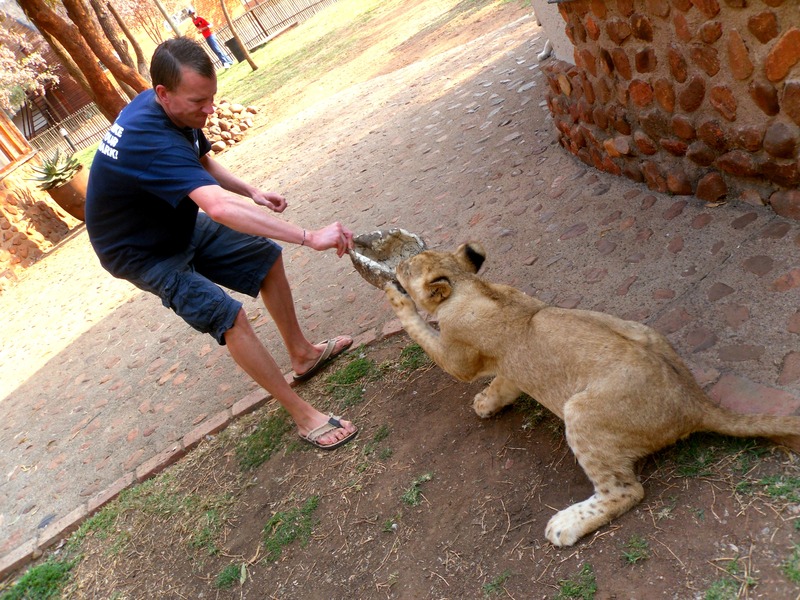 So if you ever find yourself face to face with a lion a simple stick is your best defence! Most people don’t really understand the full extent of what we did here and if someone had told me everything we’d be doing before we arrived I wouldn’t have believed it myself. Every morning we would be woken up by the best alarm clock in the world – the sound of roaring lions. We’d step out the front door to find a furry mound of cubs all huddled up on the doorstep eagerly waiting to play and be fed. One even managed to sneak into our room and get comfy on the bed when we accidentally left the door open! 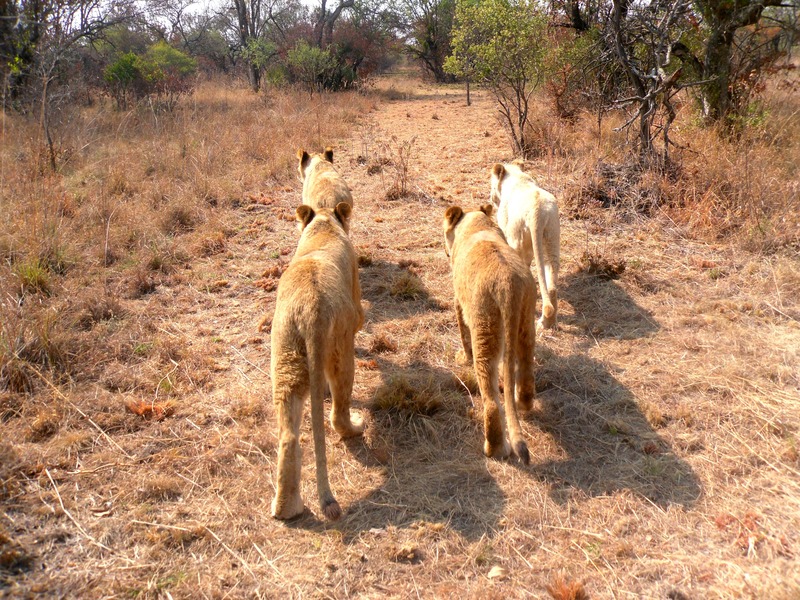 During our time here we were given certain jobs to do each day – cub duty or ranger duty. 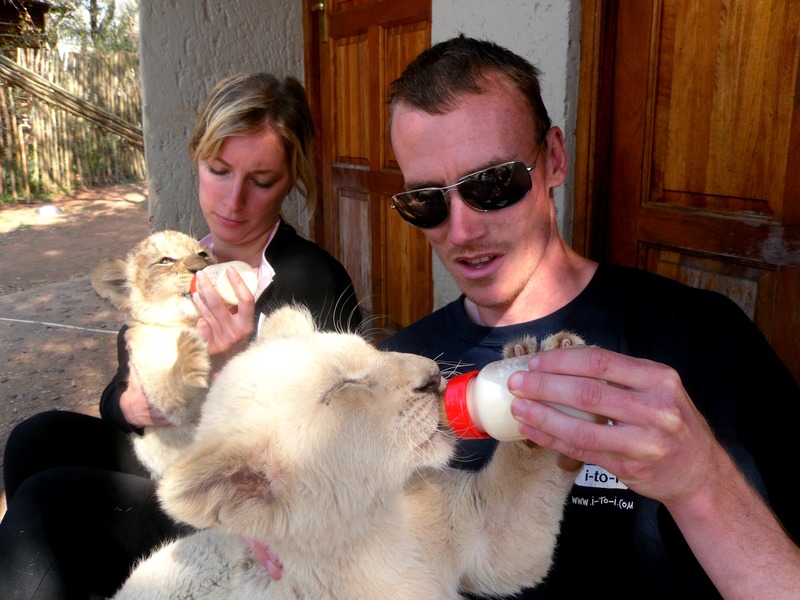 Cub duty was obviously my favourite as it meant I got to spend all day making up bottles and bottle-feeding the cubs, playing with them, making sure the bigger cubs weren’t too rough with the little ones, and generally looking after them. 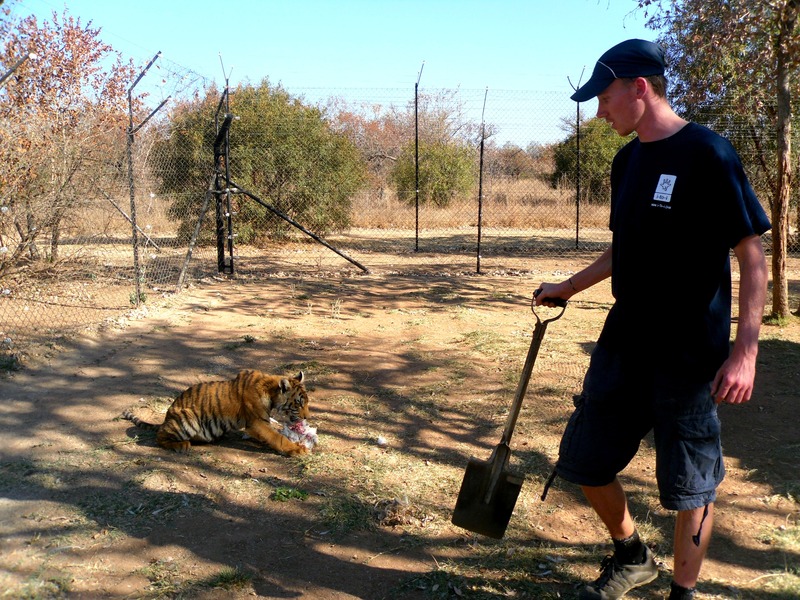 Ranger duty was more Alex’s forte with jobs like cleaning out and building enclosures, feeding the older bit cats, looking after the other animals in the park by collecting trucks full of vegetables and leaving them scattered around for the zebra, giraffe and deer to find. He even ran off to fight a few bush fires and I felt like the dutiful wife left at home with the lion babies while the husband was out fighting fires! Being cautious of the tiger cub. Even at this age tigers are so strong and unpredictable! The reserve allows school and charity visits to teach children about wildlife, so we also had the job of introducing people to the cubs and letting them have a go at bottle feeding, taking some visitors on lion walks with the bigger lions and we were even interviewed by a UK newspaper and helped set up a photo shoot (as much of a photo shoot as you can get with a pride of playful lions!). As fantastic as this all sounds, working with animals isn’t all playtime and cuddles and is obviously going to come with some mucky jobs. 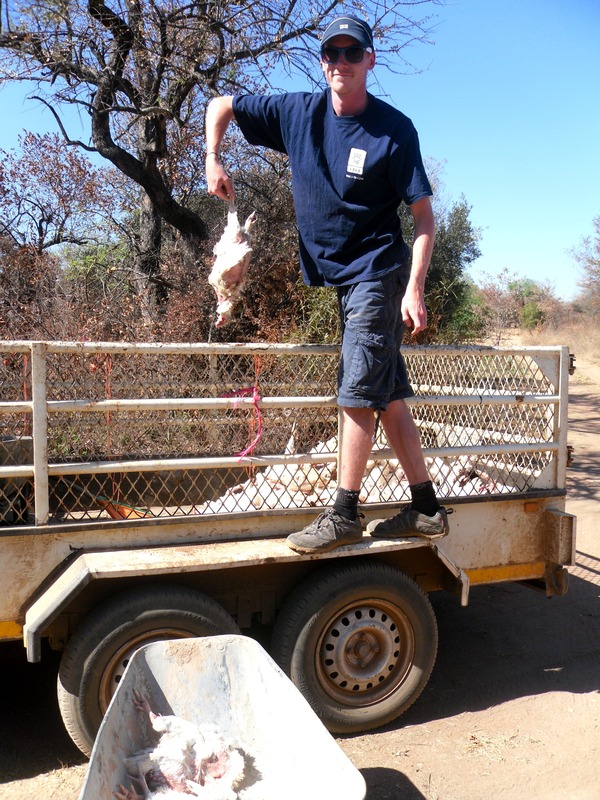 Hauling dead chickens out of the freezer for the big cats’ dinner wasn’t very pleasant so I left this job to Alex as I’m sure he loved pulling frozen chickens out of a huge pile to find that only a head or a foot had come off in his hand! Another mucky job was stimulating the cubs to go to the toilet – in other words rubbing their bottoms until they went! A very yukky job indeed especially when you felt the warm dribble of wee start to run down your arm! But with their mums not around this job falls to the volunteers. My proud moment was when I helped one of the little ones do her first solid poo! We definitely bonded after this experience! We would sit and play cards with the other volunteers while the cubs napped at our feet. 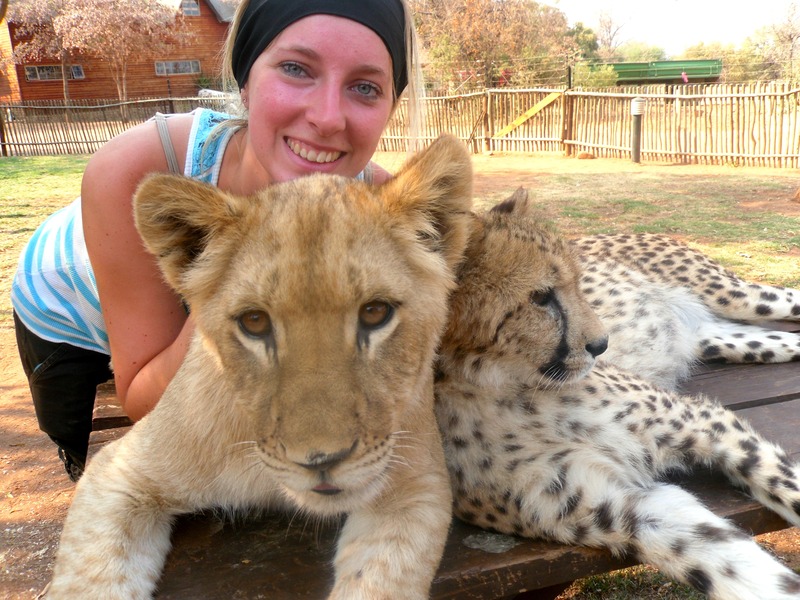 We’d lie down next to Emma, the female cheetah who was friendlier than a house cat, and rub her under her chin while she purred. We would walk around with a cub attempting to take a swipe at our legs where our shoelaces had come undone. Visitors would look at us with big eyes and shocked expressions as if what we were doing was completely insane but, after only a few days here, the shock of first arriving and getting to grips with the place and the animals soon wears off and it all becomes quite ‘normal’. But every day my time here still never ceased to amaze me. I’ve had quite a few adventures and done a lot of incredible things but this is, without a doubt, the most amazing thing I have ever done. Nothing can even compare and I know that it never will. 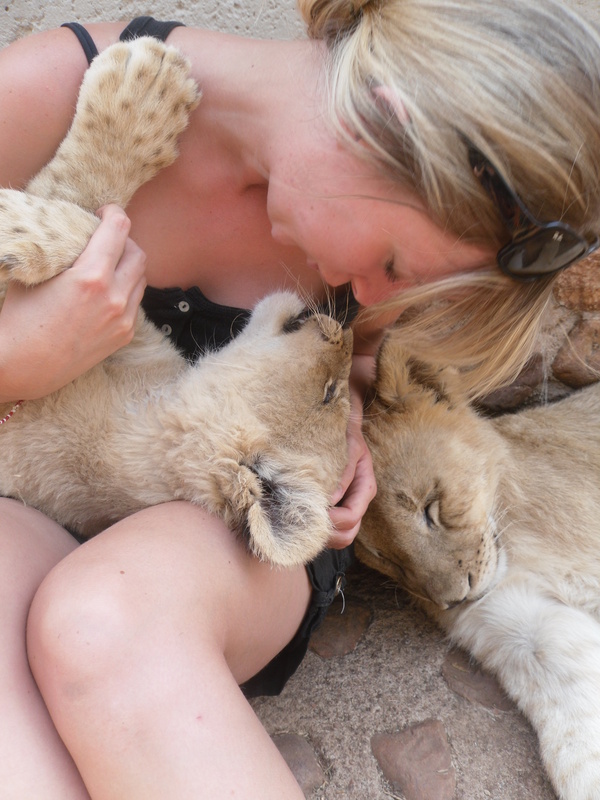 To say that I’ve cuddled, played ball with, been licked, been jumped on, been nibbled (still got the hole in my top) and been scratched (still got the scar) by lions is not something most people can say. I wish I could do this job every single day of my life. Wow, what an experience! What happens to these cubs when they get bigger? Can they ever be released back into the wild? No because they’re not used to fending for themselves so they’d more than likely end up being killed or starving if they were released back into the wild. They have a huge amount of cats here so I’m not sure whether any of them actually ever leave! Oh Ayla, what an amazing experience! 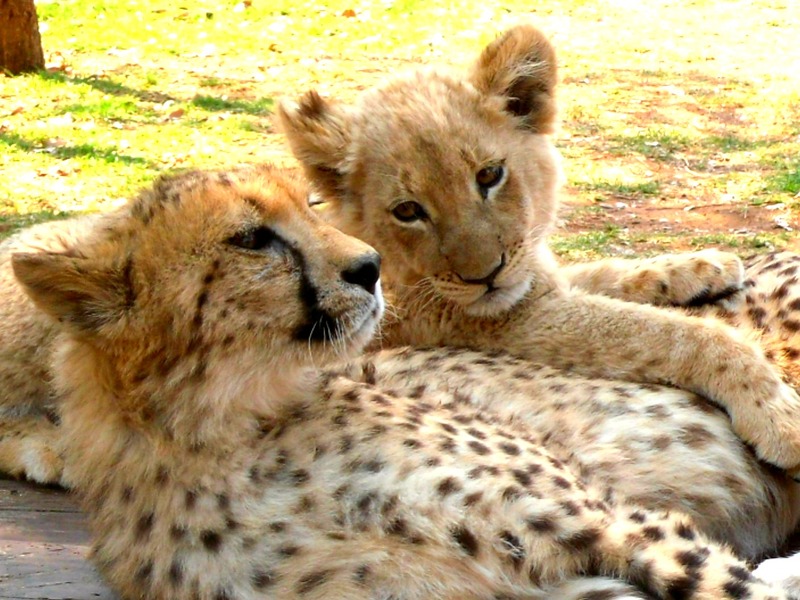 We pet cheetahs when we were in SA and I couldn’t believe it when I heard them purr. So interesting that they keep the cheetahs and lions together and that they get along. Just a little bit of volunteer jealousy happening over here at the moment. Such beautiful animals. Haha thanks Jess! They really are amazing animals. And yes they get on just like they’re family! I have so many photos from my time here it was hard to pick which ones to put up! It is by far the most incredible thing I have ever done. 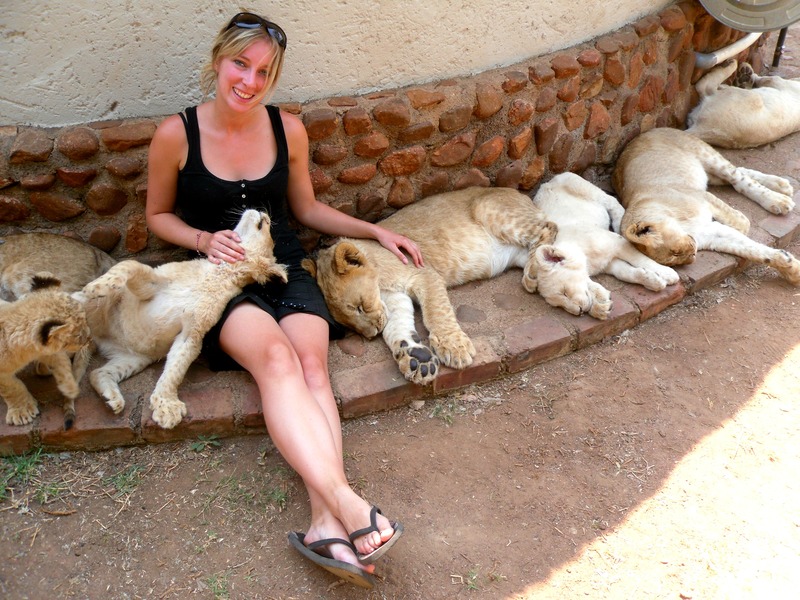 I miss the lions every single day and will definitely be doing it again some time in the future. Do it! It’s fantastic! You have to do it Simone! They’re such magnificent animals and working with them is more incredible than you could ever imagine! Hi there, i just came across your website. I’m from Hong Kong and I was wondering if you can let me know which reserve did you go to as i am planning out my trip and would like to do something similar to you guys. 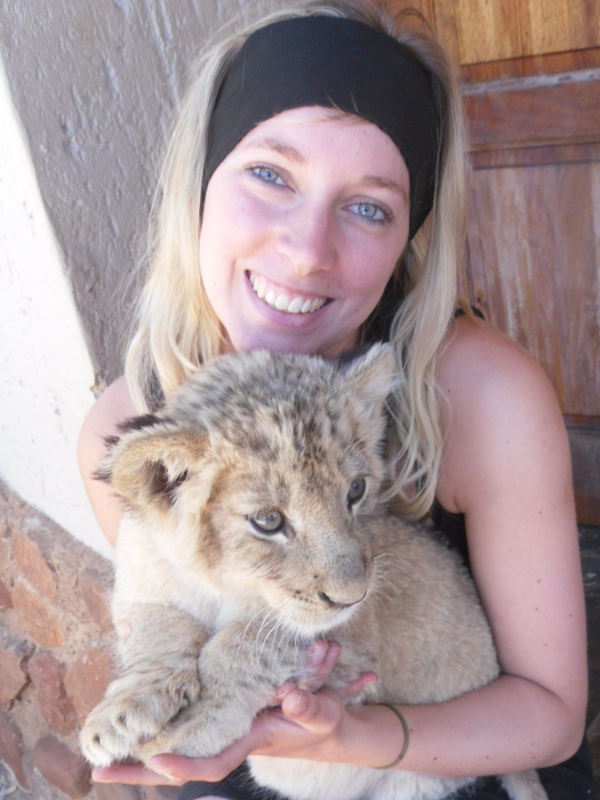 I love animals and especially lion cubs! And how long did u guys stay there? Oh my god I LOVE this! How do you go about applying to volunteer? Thanks.